Yellowstone volcano has erupted three times in history – 2.1 million years ago, 1.2 million years ago and 640,000 years ago. Scientists have previously revealed should an earthquake occur, it could take less than two weeks before a catastrophic reaction event with the potential to wipe out three-quarters of the US. 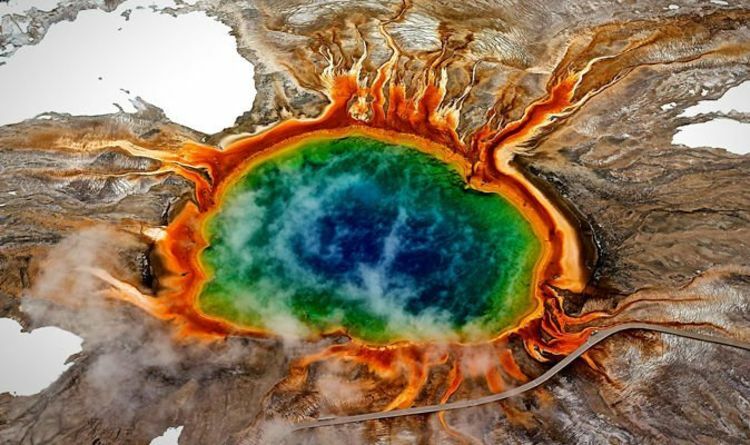 Experts have identified a weak spot within Yellowstone National Park, that could also be the catalyst. Norris Geyser Basin is the hottest and most unstable geyser, located outside of the caldera. It constantly has geologists like Jacob Lowenstein on his toes as molten rock causes it to rise and fall, it was revealed during BBC’s “Supervolcano” series. The US Geological Survey (USGS) researcher revealed in 2015: “Norris Geyser is one of the most dynamic within Yellowstone. “It is always changing and we are always noticing new things happening. “it is not actually in the caldera, yet has the highest temperature. Should the molten rock rise too high, it could cause the geyser to blow, forming an earthquake. Dr Robert Smith, another researcher with USGS, believes an event like this in an unstable area would be enough to set off a chain reaction. He said: “An earthquake here would form the heartbeat of the system. “It is an important part of the active volcano. This created an eruptive column so colossal that it covered about 60 per cent of the US in a thick layer of ash.